Find Florida Luxury Homes for Sale under $1,000,000. View all Luxury Real Estate Listings less than 1 Million Dollars in Central Florida including Million Pound Homes, Million Dollar Bank Owned, Million Dollar Short Sales and Million Dollar Foreclosures. 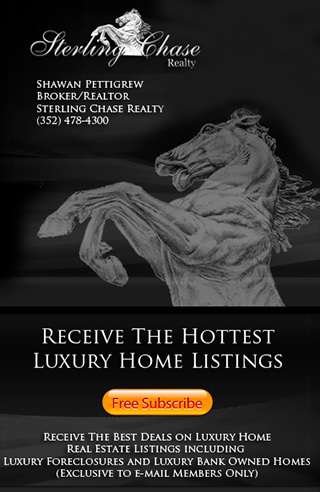 Our website is designed to "Showcase" Central Florida's Finest Homes for Sale and Luxury Real Estate Listings. If you would like more information about a certain home or community, feel free to call us at (352) 478-4300 7 days a week.